We’re excited to announce the latest release of MadCap Central, which comes packed with significant updates and enhancements. With new features such as project checklists, the ability to set vanity URLs for targets and builds, and more, it’s easier than ever to manage teams, improve content quality, and gather insights on your workflow. 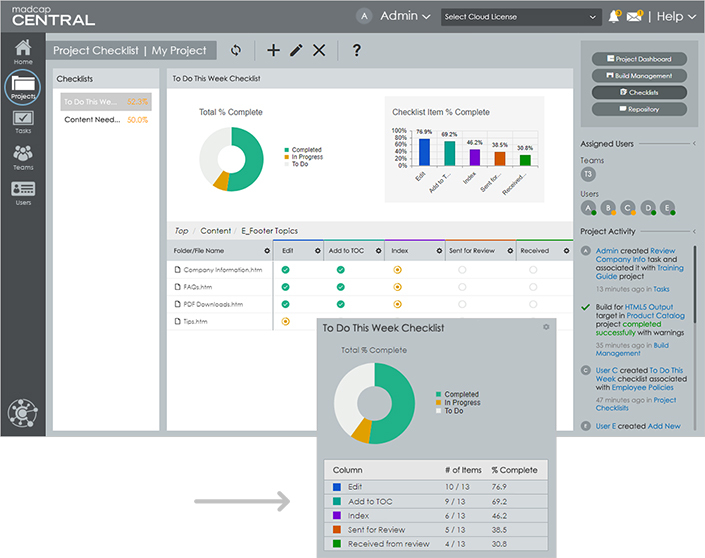 MadCap Central adds the ability to track and manage Flare projects with the all-new Project Checklists feature. Checklists can be associated with specific files (e.g., topics), or custom checklists can be created to track and manage any number of project-specific deliverables. You can set the appropriate status on each item as you work, and the top of the interface will show a chart and percentages as you progress through the checklist. Previously, you were only allowed one vanity URL for the entire license. A unique ID would be automatically generated for each target whenever you generate and publish outputs. With the new release, you have the ability to create a custom vanity URL for each target or build. This gives you the ability to have multiple outputs set to the “Live” status, each with its own URL. In addition to your live URL, a private URL is also generated with each build. Private URLs are a useful way to share generated outputs, review content, and transfer knowledge with individuals in your organization. For each build set to “Live,” you now have the option to prevent the output from being seen by search engines. This is useful for organizations that want their documentation seen by internal users only, or if they have multiple versions of documentation. Project linking is now supported when you build outputs from MadCap Central, letting you link to external Flare projects. Central IDs for your linked project must be stored in the main project, which is generally the project from which you are generating outputs. Global Project Linking: A feature that lets you import content and project files contained in another Flare project, thus allowing you to maintain the information in one location but reuse it in any other project. Runtime Merging: You can merge Flare projects together by linking targets with the same output type. The result is output that appears as one Help system. Multilingual Output: You can create multilingual outputs by linking translated Flare projects to your current project. The new release also comes with bug fixes, performance enhancements, and more. To learn about the new features, as well as recently added enhancements, view the What’s New topic here. Don’t Miss Our Upcoming Webinar! The October 2017 release of MadCap Central adds the all-new Project Checklists feature to track and manage your Flare projects, the ability to set multiple live builds in a target using vanity URL paths, private URLs for internal review, the option to exclude live builds from search engines, new project linking support and much more. Want to try the new features for yourself? You can get started with a free, fully-functional 30-day trial at any time. Our award-winning technical support team is available to answer any questions by phone or email as you evaluate. Additionally, we can schedule a private demo to provide a personalized overview, as well as discuss any needs or best practices for your organization. We hope you enjoy the new features of MadCap Central!